The ClareHome v.6.0.6 release addresses issues related to location and time zones. New CLIQ.minis require a restart after saving and deploying a Fusion project with location information. The ClareHome v6.0.6 release corrects this issue and does not require a CLIQ.mini restart. 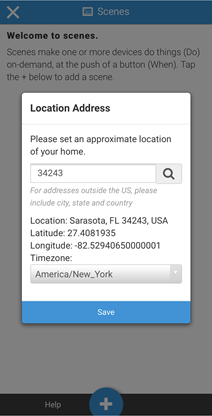 If there is no location information saved in Fusion, the user will be prompted for it in their ClareHome app. Note: Without a location, the project is unable to determine a user’s time zone. If there is no time zone association, schedules and other automations in ClareHome will not properly function. 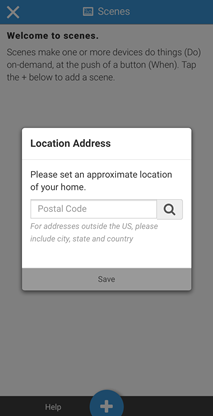 If a location is not configured when accessing options in the menu, the user is prompted to enter their postal code. This determines the time zone for the user, making schedules and automations accurate. 1. 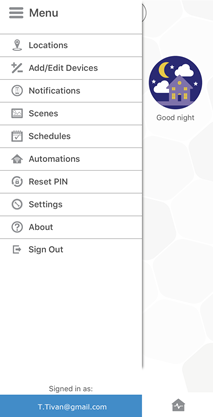 Access your ClareHome project, and then tap the Menu icon. The user is prompted to enter their postal code. 3. Enter the postal code, and then tap the Search button. The location information for the postal code displays. 4. Verify the time zone, and then tap Save. The following issues are resolved with the ClareHome v6.0.6 release.